Mexico is already pivoting away from the U.S.
Gustavo Bojalil is calling President Trump's bluff -- in his own way. 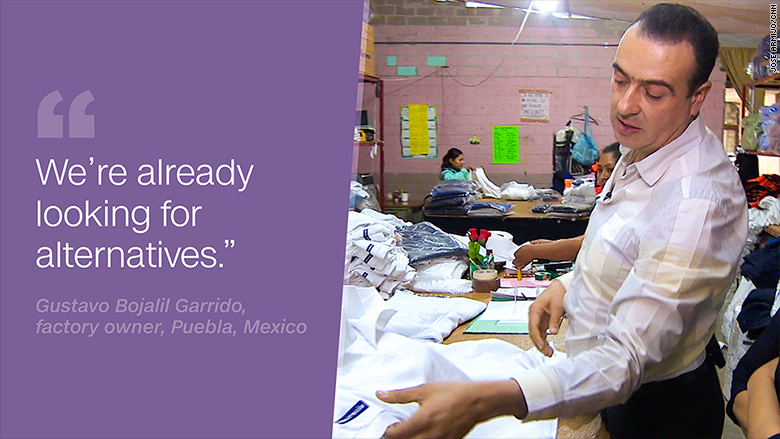 As the owner of a textile factory in Mexico, Bojalil is naturally worried about President Trump's rhetoric on imposing tariffs on Mexican goods or ripping up the free trade deal NAFTA. About 20% of the clothes from his factory end up in the U.S. So Bojalil, 49, says he's talking with companies in Spain and Colombia about buying his clothes. He is also setting his sights on Argentina, Brazil, Bolivia and Chile as new markets to explore. "We're already looking for alternatives," says Bojalil, whose factory is in the city of Puebla, about 80 miles southeast of Mexico City. "We already went to Spain -- to Madrid, to Barcelona -- to try to negotiate and talk with the industry there." "I don't think he's going to be able to get a 20% tariff," Bojalil told CNN's Leyla Santiago. But Bojalil isn't taking any chances. He employs 180 people at his textile plants. Trump's potential tax on Mexican goods would hit his business hard, costing him revenue and nearly 30 jobs, he estimates. Shrewd Mexican business owners like Bojalil are starting to look for ways to reduce their dependence on the U.S. economy as the uncertainty of Trump's policies looms large. About 80% of Mexico's exports go north of the border. There's even an old saying: When the U.S. sneezes, Mexico catches a cold. Now Mexicans are looking for ways to inoculate themselves from the cold. Beyond tariffs, Trump threatens to tax Mexican remittances and potentially withdraw from NAFTA. That would badly hurt Mexico's economy, experts say. Mexico's president, Enrique Pena Nieto, recently announced a new push for trade deals with countries in Latin America, Asia and Europe. "Mexico will become closer to Argentina and Brazil...to deepen and expand trade opportunities," Pena Nieta said on Jan. 23. Chinese auto company JAC Motors and Mexico's Giant Motors announced earlier in February they will invest $212 million in an existing car plant in Hidalgo, Mexico, to build SUVs. Experts say that Trump's criticism of Mexico is only playing into the hands of China and others. "My sense is that if [NAFTA] were to dissolve, we would see Chinese efforts to strengthen trade and other economic ties with Mexico," says Margaret Myers, director at the Inter-American Dialogue, a Washington think tank. "China-Mexico relations are at an all-time high." Europe wants in too. Volkswagen's biggest factory outside Europe is in Puebla. Audi also opened a new plant in Puebla in September, and BMW recently announced plans for a future plant in Mexico. Mexico's economic minister, Ildefonso Guajardo, and his counterparts in the European Union recently agreed to speed up trade talks to update an existing agreement between Mexico and the EU. Europe has represented 40% of total foreign investment in Mexico since 2000. While the EU and Mexico had begun trade talks in 2013, there's a new sense of urgency to get a deal done. "Modernizing the agreement, in our bilateral relationship, that's the No.1 item on the agenda," the European Union's ambassador to Mexico, Andrew Standley, told CNNMoney. "It's a shared desire to proceed as quickly as possible with this negotiation." On top of that, Mexico's main exports are cars and auto parts. Brazil and Argentina make those too. Mexico would also compete with European automakers across the Atlantic. Plus the advantage of cheap labor in Mexico isn't as valuable when you consider shipping costs to Europe. But some Mexicans appear poised to pursue this strategy. For Bojalil, the factory owner, he sees Trump's criticism as free publicity and an opportunity for the rest of the world. 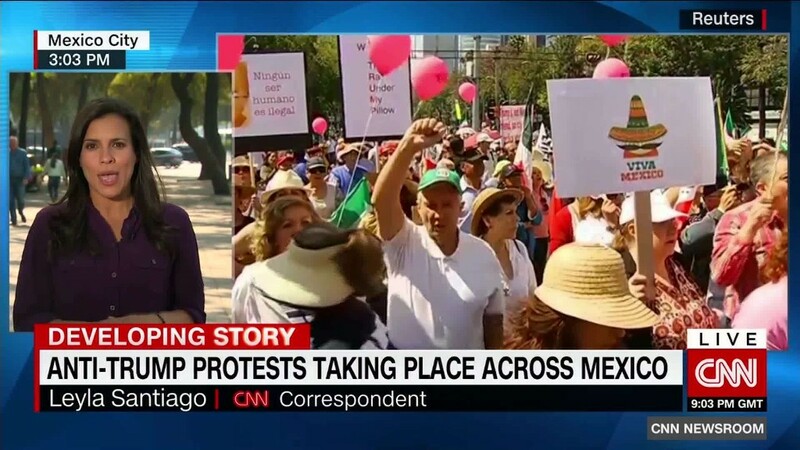 "Thanks to President Trump, the whole world is turning to Mexico," says Bojalil.